The Sustainable and Resilient Tanzania Community Program (SRTC) is an interdisciplinary, international service-learning program for students, faculty and staff across several Ohio State departments and Tanzanian partners. SRTC Program co-founder Joe Campbell will discuss the program’s participatory, values-based approach working with the village of Marwa and the Same District (Tanzania) to bring water from the Pangani River to the village in accordance with community-expressed aspirations and development goals. Joe Campbell is a Research Associate and Lecturer at The Ohio State University’s (OSU) School of Environment and Natural Resources and a U.S. Fulbright Scholar serving at the University of Dodoma, Tanzania. His research, teaching and professional focus is on the balance between community economic development and natural resource management in rural areas of the U.S. and abroad. His research background includes work with multiple federal U.S. agencies, including the U.S. Department of Agriculture, Environmental Protection Agency, the Office of Surface Mining, AmeriCorps*VISTA, and the Federal Reserve Bank of Cleveland as well as civil society groups including OSU Extension, American Society of Agronomy, and the Kettering Foundation. He’s led applied, multidisciplinary research teams on studies of the impacts of energy development and regional planning in dozens of rural mining and agricultural communities in the U.S. and in Ghana. He is from Columbus, Ohio and volunteers with several local and regional non-profit organizations. His current research investigates the sustainability of water access project installations and effects on community well-being and economic development in rural Tanzania. 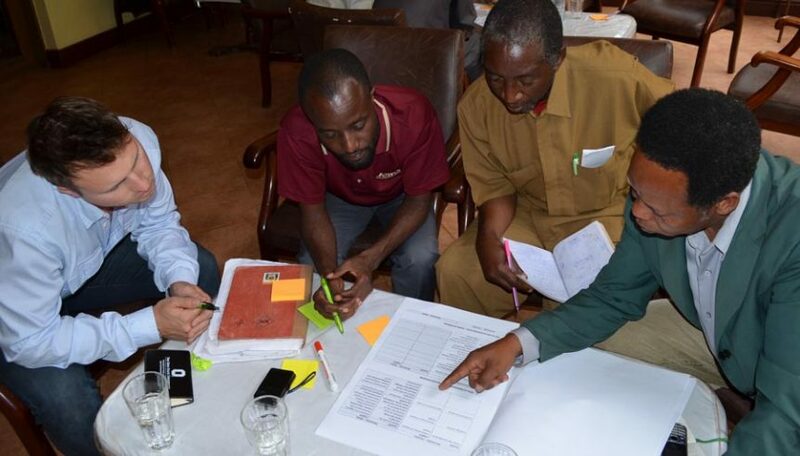 Photo: Joe Campbell works with community leaders from the village of Marwa, Tanzania and the Kilimanjaro Hope Organization as part of the Sustainable and Resilient Tanzania Community Program. Source: Joe Campbell.